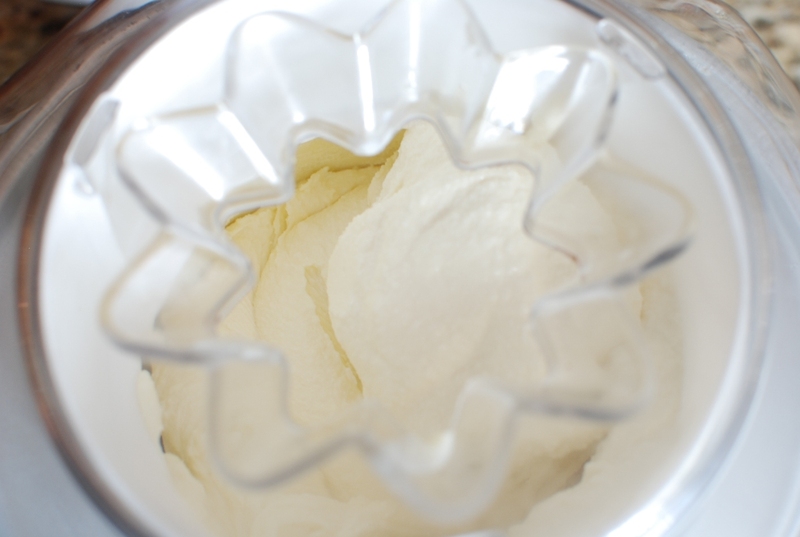 I’m continuing my obsession with Ricotta today with this AMAZING Ricotta Gelato. A couple of years ago we went to our favorite Gelato hang out. 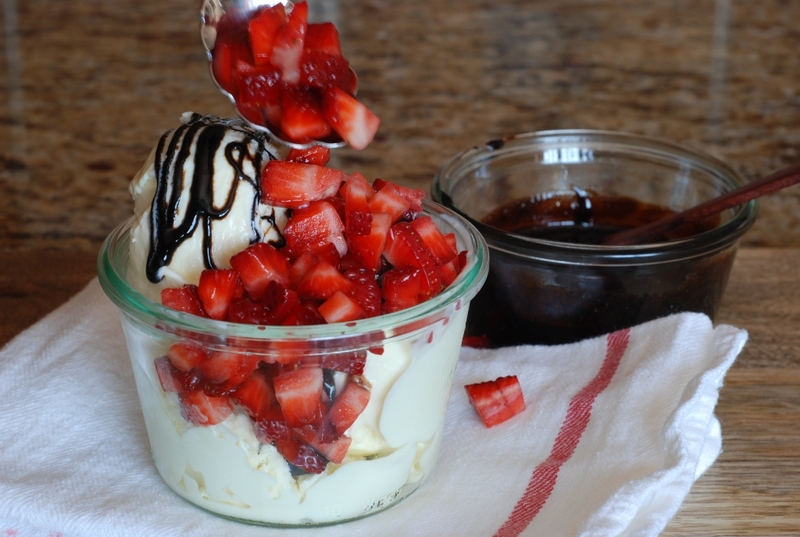 It was there that I discovered a Ricotta Gelato drizzled with a balsamic vinegar glaze. I had to try it. It was just plain delicious. 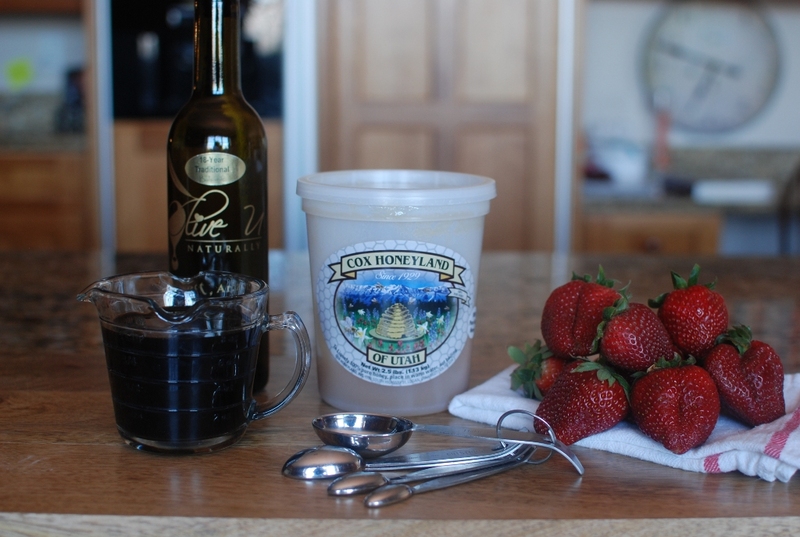 The balsamic vinegar paired with the gelato sent my taste buds into euphoria. Naturally when I found myself with about 5 lbs of ricotta, this creamy sensation had to be reproduced. No fat in this recipe! 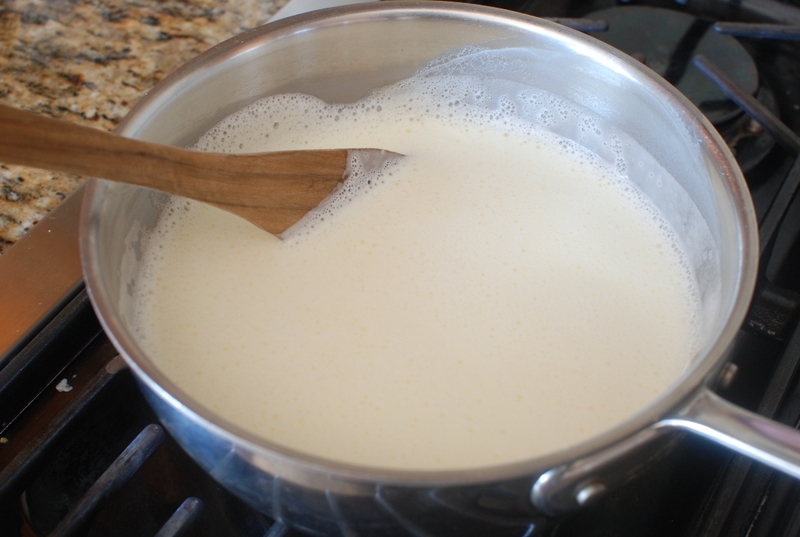 Heat the milk in a saucepan; bring to a simmer. 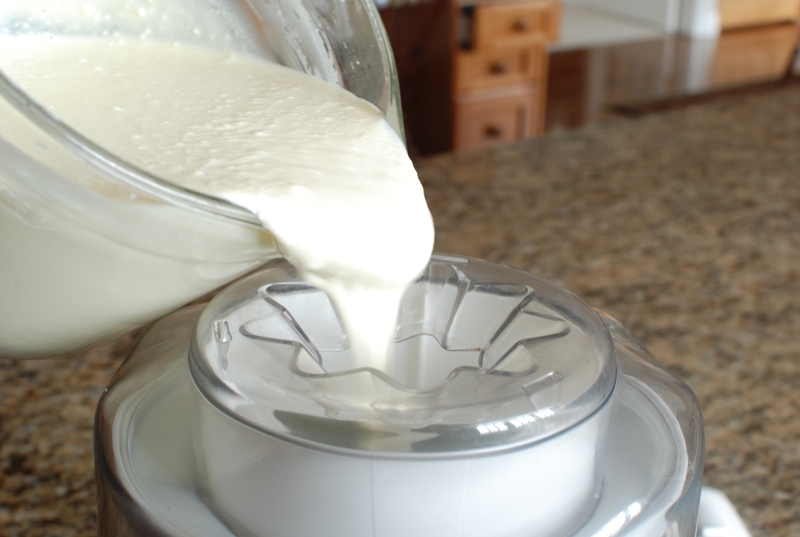 While the milk is heating place the egg yolks in the bowl of an electric mixer using the paddle attachment. 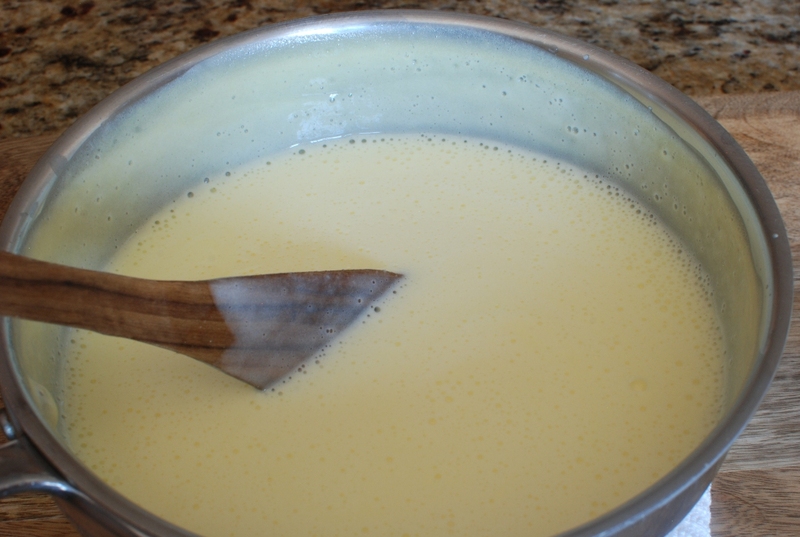 Add the sugar and beat until the mixture is very thick and pale yellow. 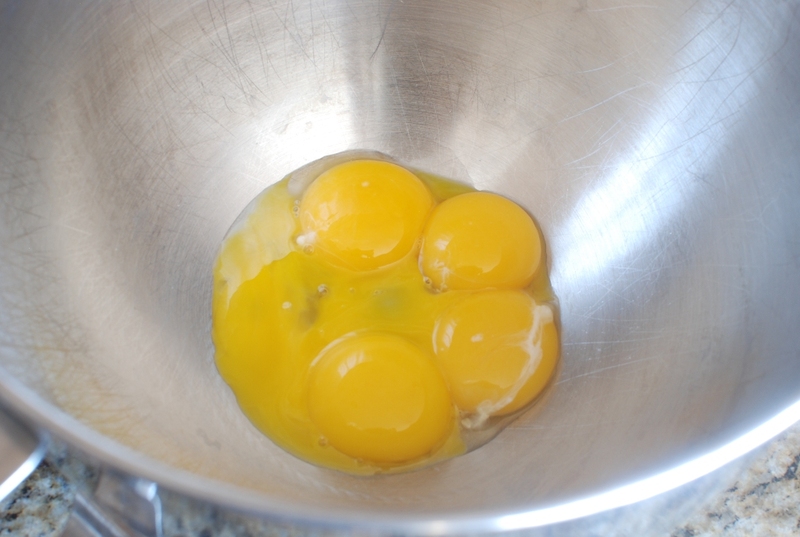 Not quite sure what happened to the photo of how the egg yolks should look ??? 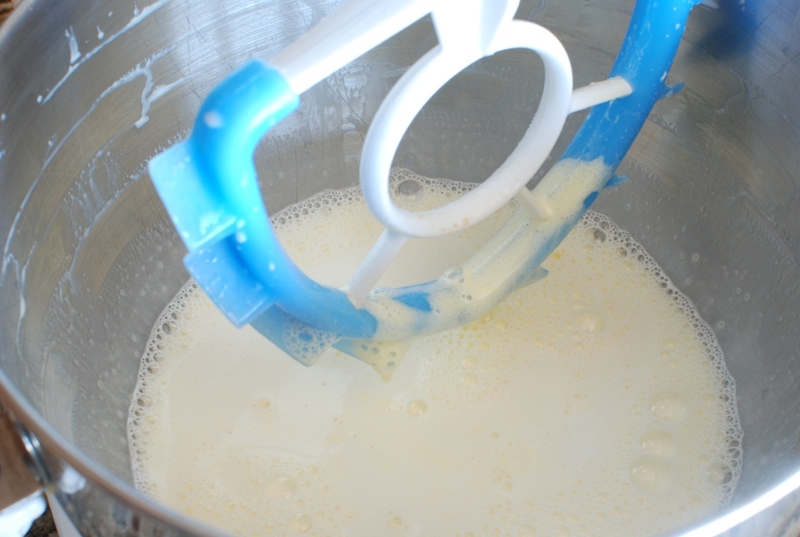 With the mixer running, slowly add half of the warm milk mixture. 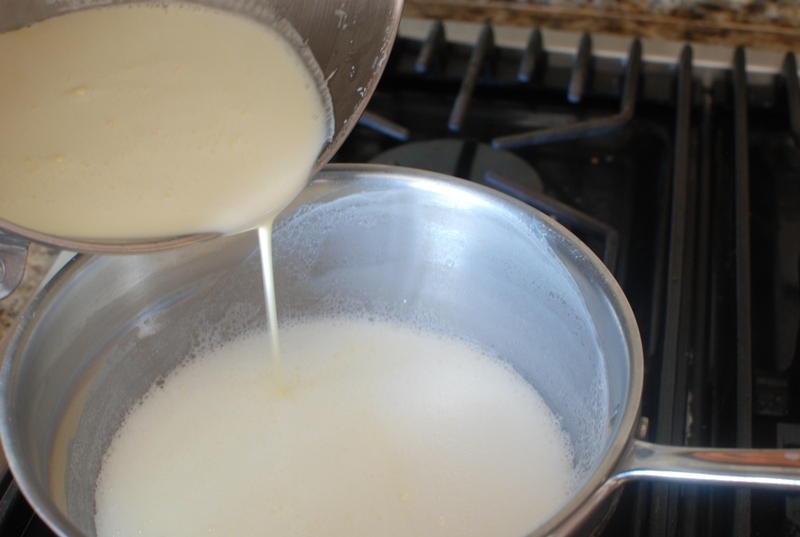 Return the egg mixture to the saucepan with remaining milk. Cook just until the mixture coats the back of a spoon. Draw your finger across the spoon. If it leaves a trail, it’s done. 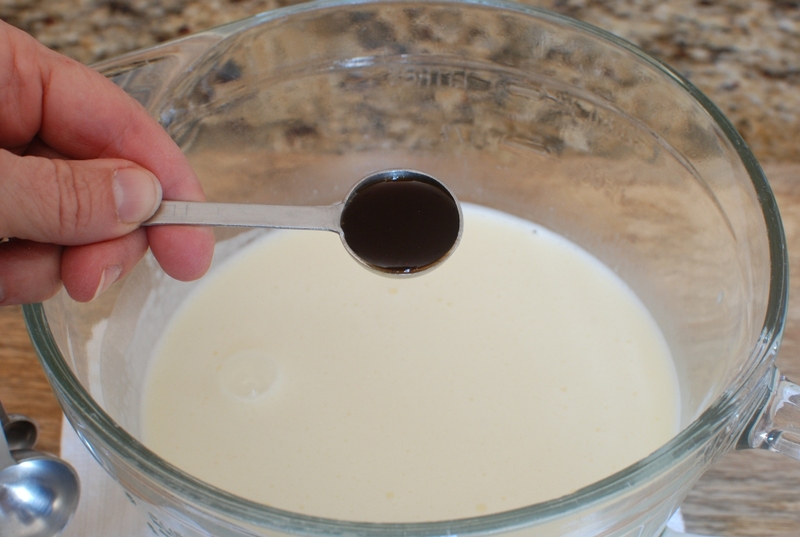 Stir until cream is well blended. Pour the mixture through a fine wire mesh strainer. 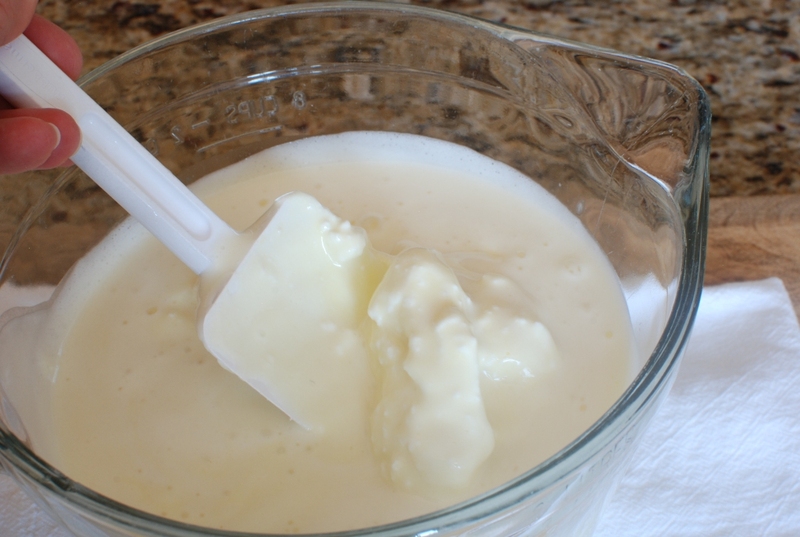 You want to make sure there are no little cooked egg particles in the gelato mixture. This will make the mixture very smooth. I’m a big fan in leaving ice cream or gelato base in the refrigerator overnight. I really think it helps create greater volume when freezing. I’m using an electric ice cream maker that holds 1 1/2 quarts. You will notice that the gelato base is super thick. With the ice cream maker running pour the mixture into the ice cream maker and freeze according to the manufacturers directions. Note: This makes enough base to fit into a 2 quart ice cream maker. 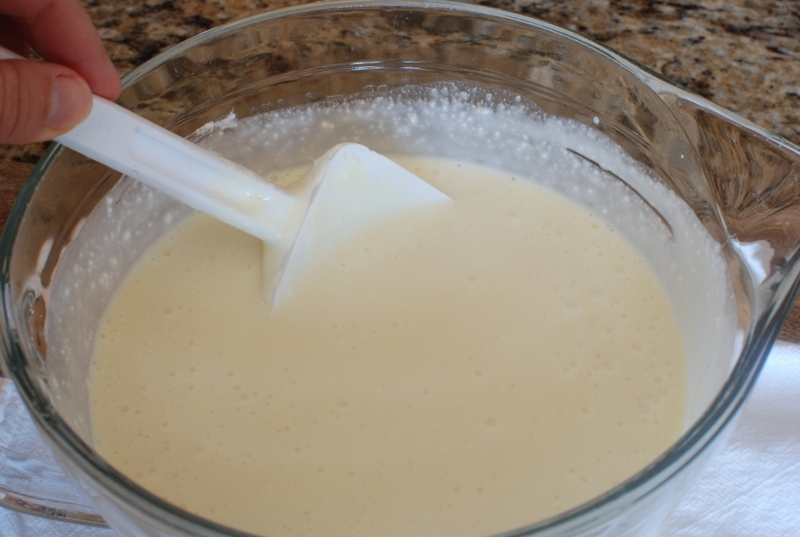 Freeze only until the mixture is thick and holds it’s shape well. 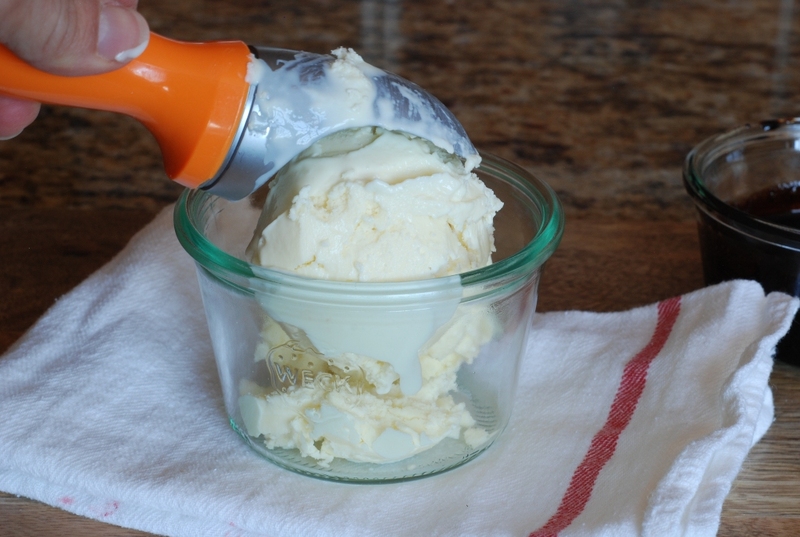 Let me give you some advice on using the ice cream maker that has the canister that you freeze. If you think that you will get a more solid gelato by letting the maker continue to run, you are wrong. The ice in the container will begin to melt and it will also melt your gelato or ice cream. If you let it run for 30 minutes or more you will end up with the same liquid you started out with. Be very careful. Remove the gelato from the ice cream maker. 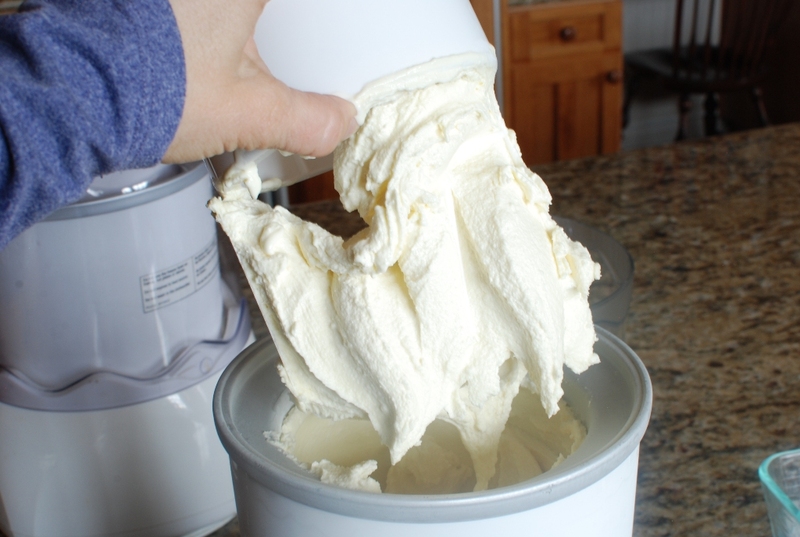 Place the frozen gelato into a separate container, cover and freeze until it reaches your desired consistency. When the gelato freezes a bit firmer, it becomes more creamy. 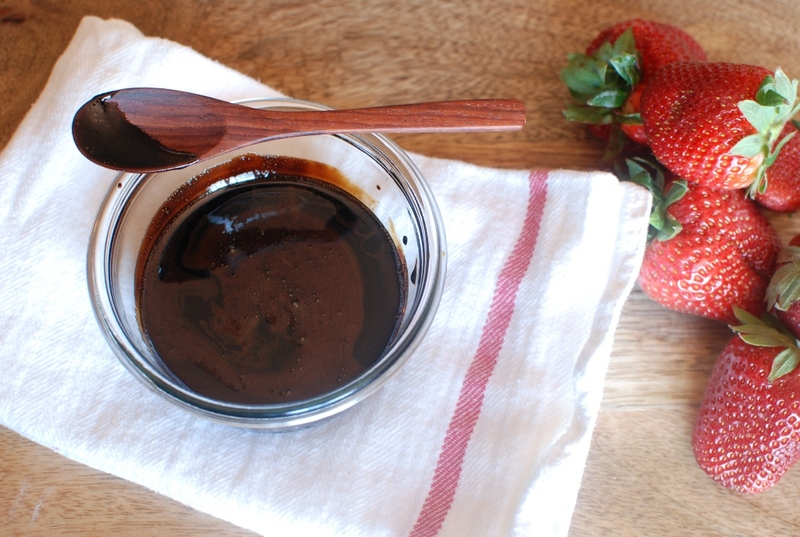 While the gelato is setting up, make the balsamic glaze. Note: This glaze is fabulous on just about anything. I LOVE to drizzle it over pizza. Who knew it would be so fabulous on gelato?? Stir the mixture while bringing to a simmer. Continue to stir and simmer until the mixture reduces by half. The glaze will coat a spoon. Pour into a bowl or other container and allow to cool. It’s great to store in a squeeze bottle. 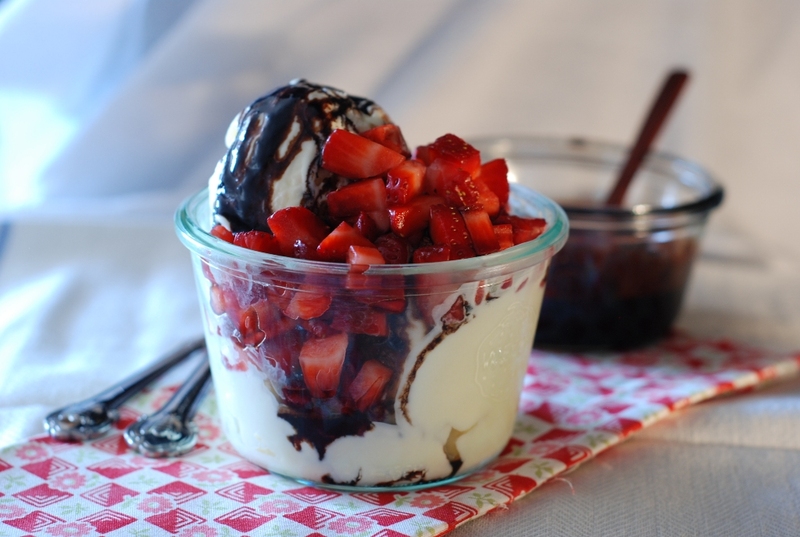 It makes a handy and convenient way to drizzle just about anything you eat. Place a scoop or two of gelato into a serving bowl. Drizzle with the cooled balsamic glaze. Top with a dice strawberries. 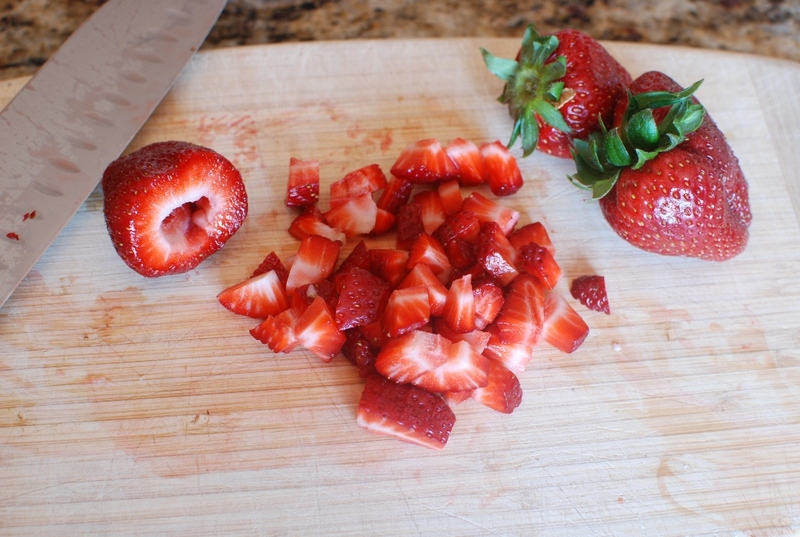 I like a ton of strawberries. The tartness of the vinegar combined with the sweet ricotta just makes my mouth water. Heaven in a bowl. I started this really bad tradition of eating all of my photo’s. Bad idea. Delicious, but very bad idea. 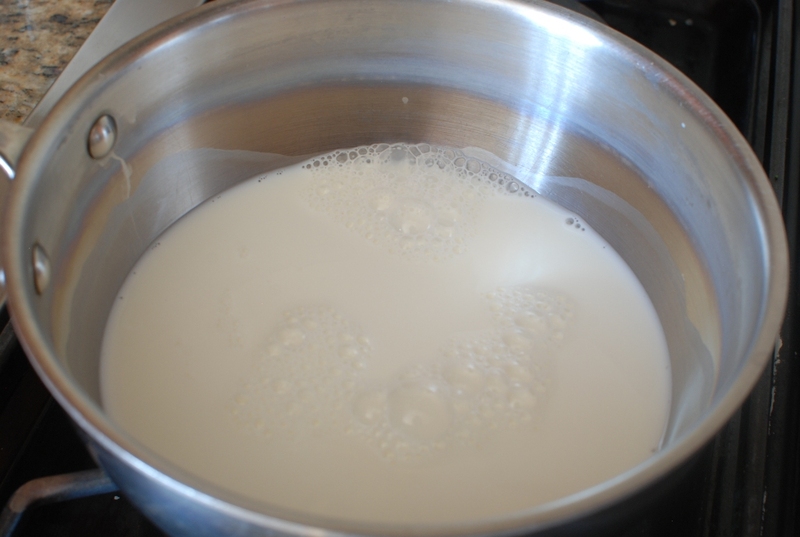 Place the milk in a medium size saucepan and bring to a simmer. 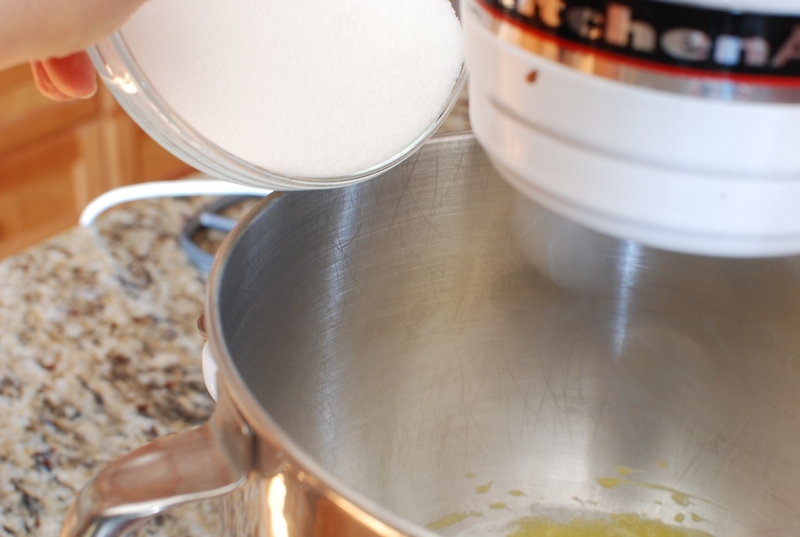 Combine the egg yolks and sugar in the bowl of an electric mixer fitted with the paddle attachment. 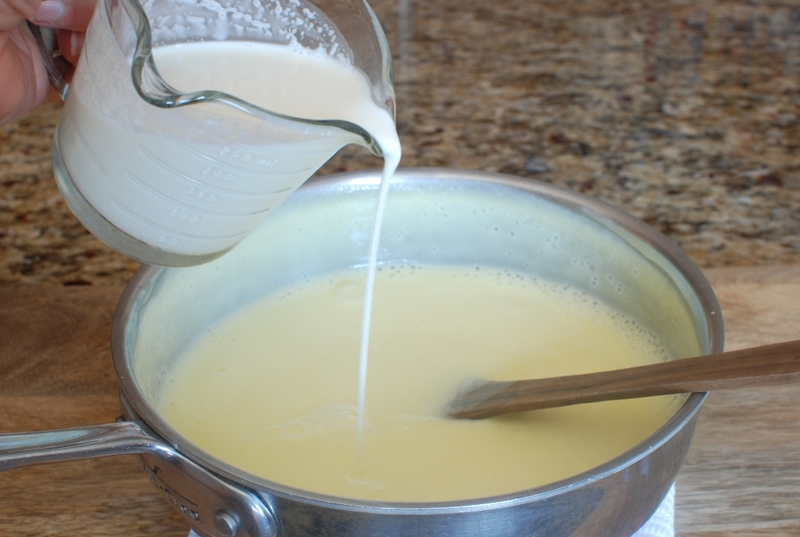 Cream at medium-high speed until very thick and pale yellow. 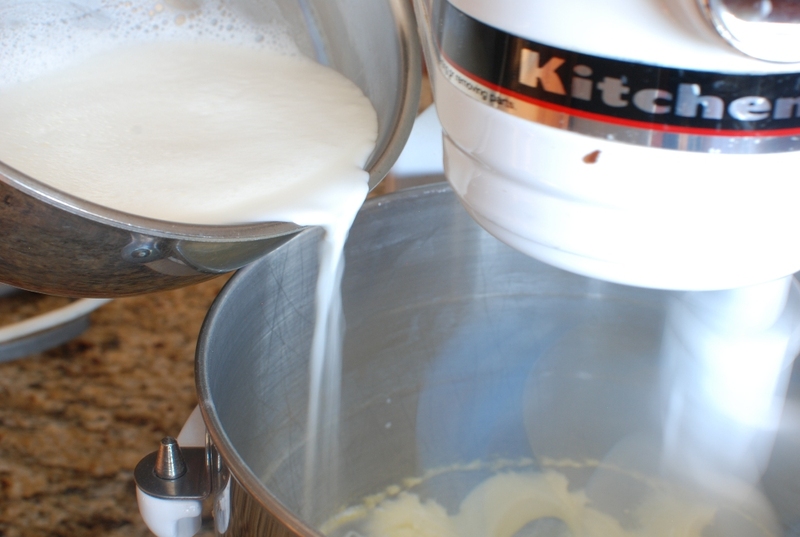 Add half of the warm milk to the egg mixture and stir until blended. 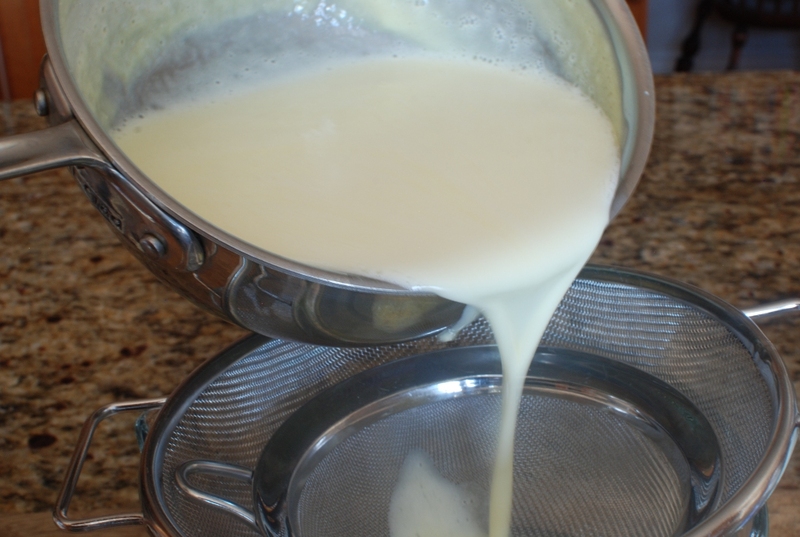 Return the new egg mixture to the sauce pan with remaining milk. 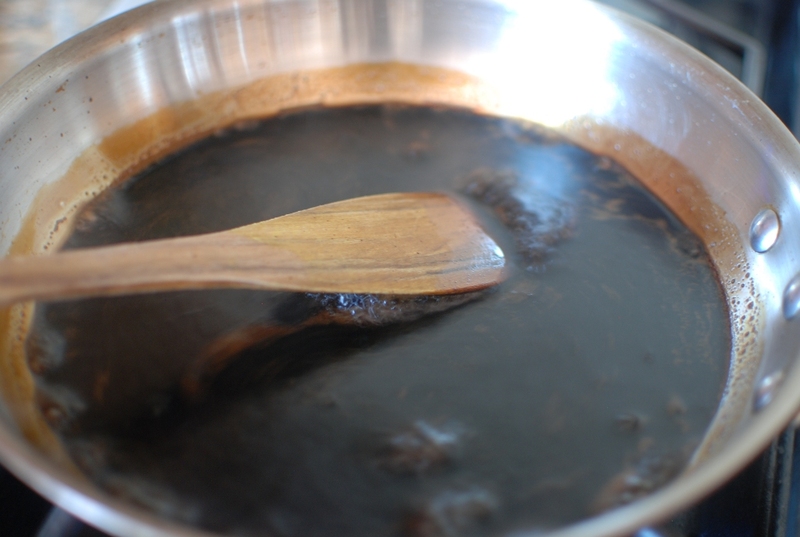 Cook over low heat until the mixture is thick enough to cover a wooden spoon, stirring constantly. Remove from heat and add vanilla; stir to combine. Strain the mixture through a fine mesh strainer. 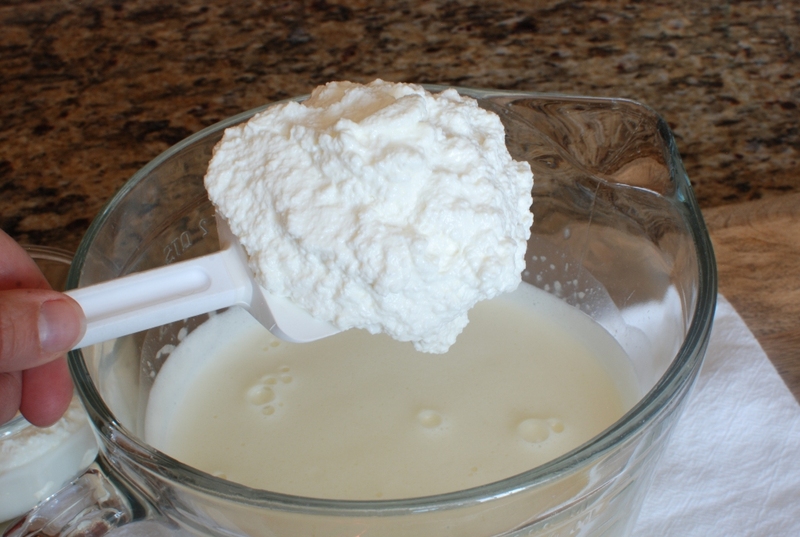 Stir in ricotta cheese until mixture is smooth. Cover and refrigerate over night or until well chilled. Freeze in an ice cream maker according the manufacturer's instructions. Store in an airtight container in the freezer. 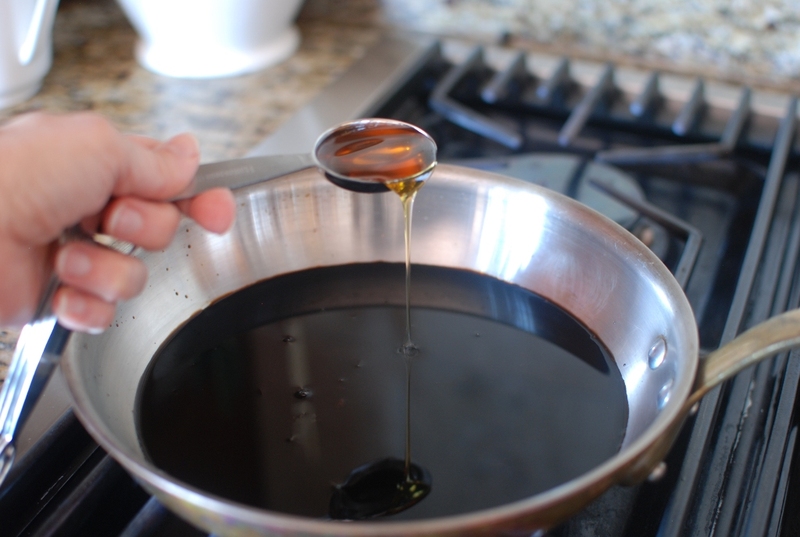 In a small skillet combine vinegar and honey. 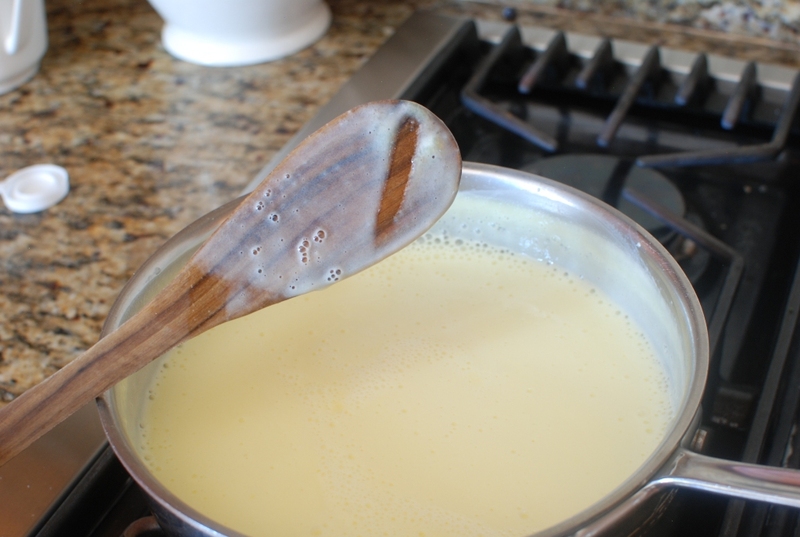 Heat mixture, stirring constantly, until the mixture is reduced by half and coats the back of a spoon. Remove from heat and transfer to a container or bowl. Allow mixture to cook before drizzling on the gelato. I had this flavor at Copa the last time I was in SLC and decided I must crack their code so I can make it at home. So glad I found your recipe! It is a divine flavor combination. 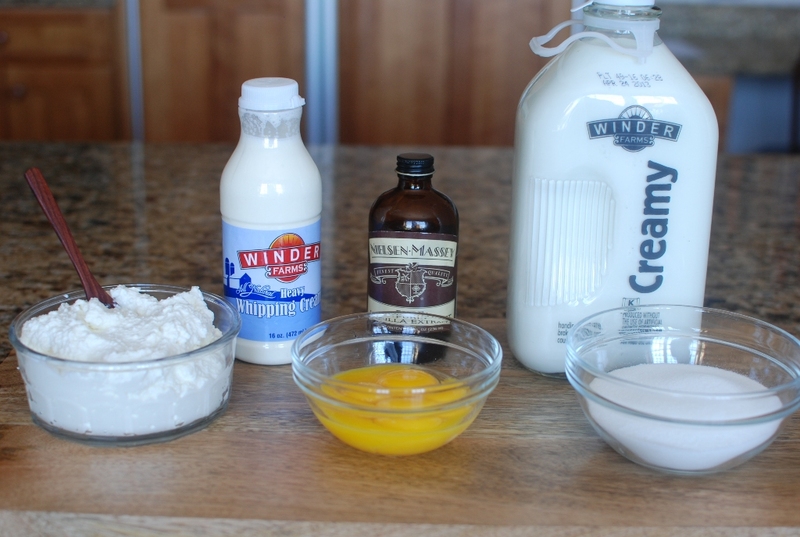 I tried the glaze and strawberry combo with your buttermilk panna cotta for a fun spring combo, and it was amazing! Thanks so much for posting this fabulous recipe! What a fabulous idea! Thanks for sharing. I'm going to try that myself. I made this over the weekend and it was so awesome!!!!! 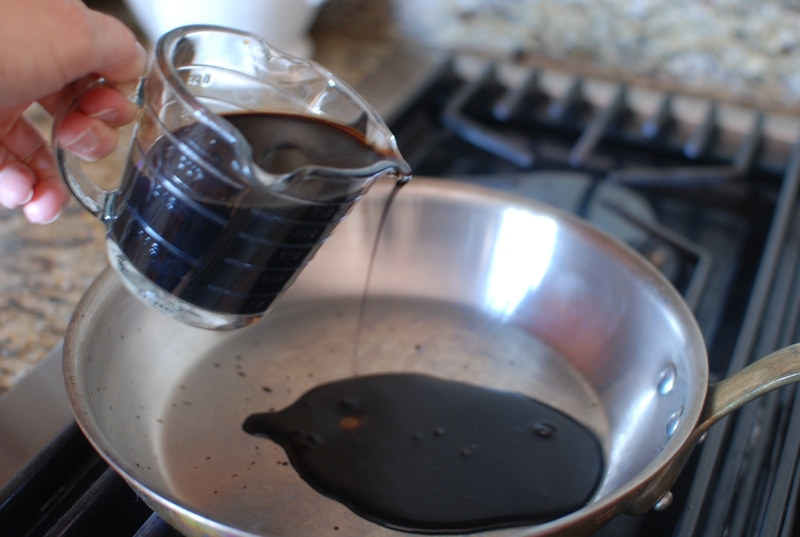 The only thing that went wrong for me was that I burned my balsamic glaze so it tasted pretty bad and I could not use it. But next time I make it I will be more careful because I can imagine the combo would be awesome! But alone the gelato was still rockin! Thank you for the recipe and keep them coming!!!! Hooray! I'm so happy the hear that someone made this. It is amazing. 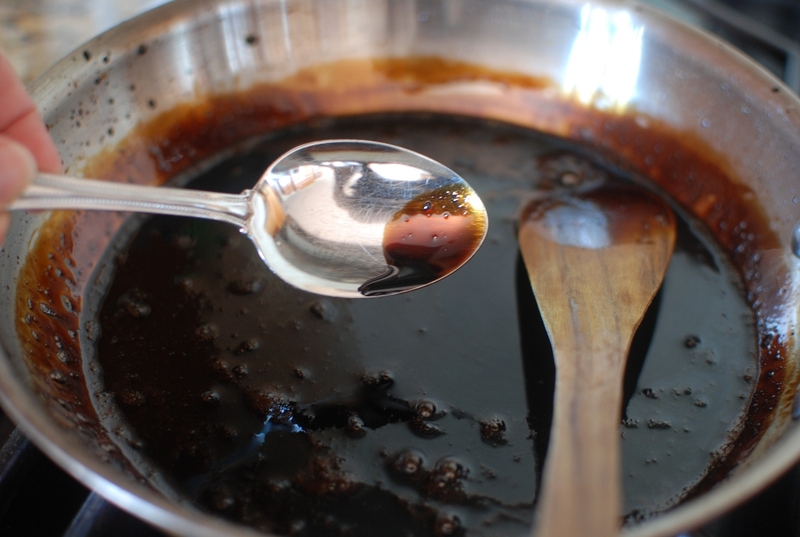 Next time your balsamic glaze will be perfect. Thank you so much for your kind comment. I'm so happy our mom forwarded my link. I love her. Your recipes really brighten my day…I am always so glad when I see a new article in my RSS inbox. Your photography is lovely! My mom recently sent me a link to your site and I am so happy she did. Do it, Marilyn. I miss you. Come back. You should totally go for the ice cream maker. You will never regret it. 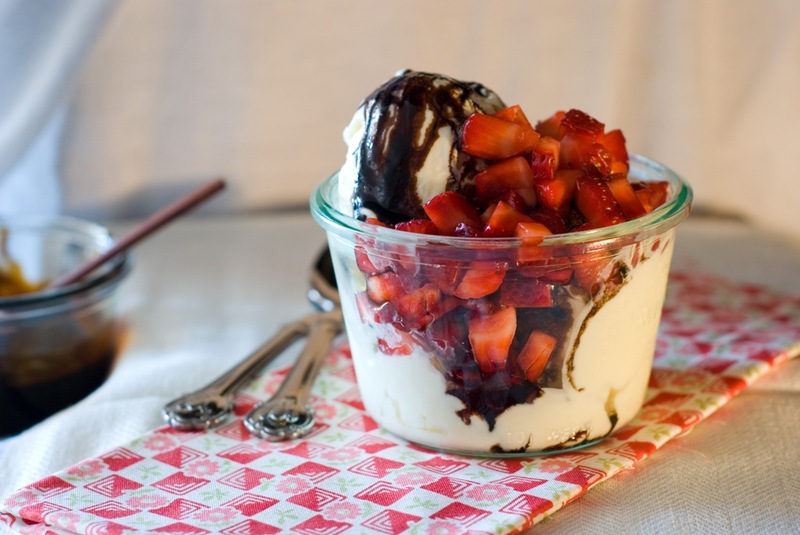 This is an dessert you should only make on special occasions IF you ever want to wear that swimsuit. As always, thank you for your fun comment. Oh Jessica, stop….please stop. Hahaha that's so funny. Smile of the day. You're pretty much THE Iron Chef. Hiding away in making all these wonderfully, creative, dishes. 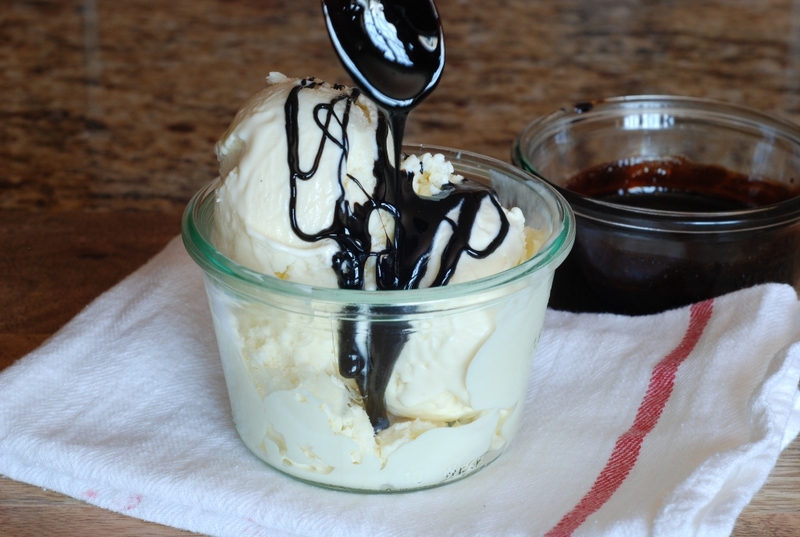 Cause really who else beside an Iron Chef would come up with a balsamic honey glaze to go over a ricotta gelato. Seriously, you're awesome! Hi Elizabeth, This is NOT above your skill level. The worse thing that you could do would be to cook the eggs is the custard. If you keep the heat low and continually stir the mixture, you are home free. Don't doubt yourself. 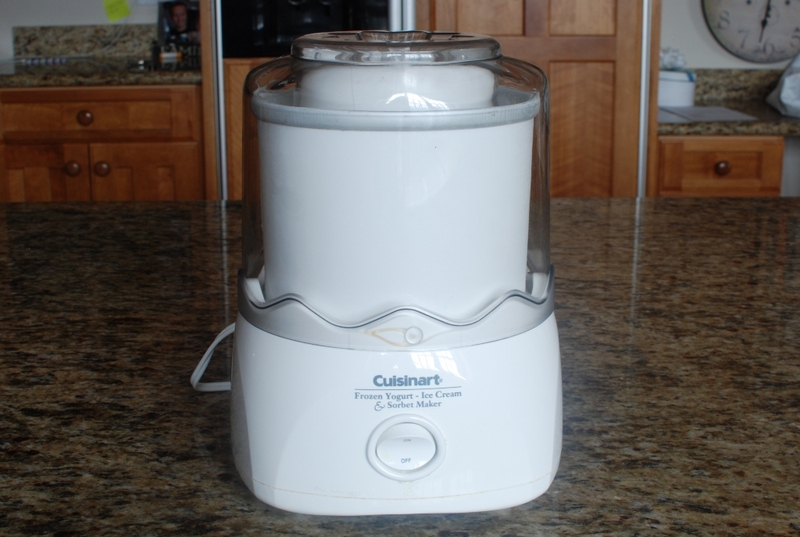 If you have a ice cream maker, go or it!!! Call me and I'll walk you through the process step-by-step OR I'll come to your home and we'll make it together (that would be so fun). DO IT!! My heart is broken right now because I know myself well enough to know that I will probably never make this recipe (I think it's over my skill level?) but I hope I'm wrong. It looks simply so good (see what I did there).